Met het eenvoudige en goedkope Ramsey C-Level continu niveaumeetsysteem meet u het niveau in silo, bunker of tank. De ronde krachtopnemer is in de ondersteunende constructie van bijvoorbeeld een silo geperst. De krachtopnemer meet de vervorming van de constructie als gevolg van de inhoudsverandering in de silo. Het niveau kan zowel in procent als in ton worden gelezen. Weighing & Inspection heeft een uitgebreid gamma aan precisiekrachtopnemers waarmee u, al dan niet ijkwaardig, een nauwkeurig statisch weegsysteem of een batchweger kunt verwezenlijken. Voor de weegprocessor kunt u kiezen uit verschillende types: Smart Junction-Box, Mini-Tech of Micro-Tech, in twee uitvoeringen: paneelmontage of wandmontage. De industrieën waar u Hycontrol aantreft zijn: water en afval, voeding en drank, de chemie en de petrochemie, milieutechnologie, groeven, aggregaten en de mijnbouw. De in de UK leidende fabricant van niveauschakelaars en -meting Hycontrol biedt een zeer uitgebreid pakket aan van instrumentatie voor de bulk en vloeistofverwerkende industrie. Het gamma omvat palletschakelaars, trilvorken, capacitieve en admittantie niveauschakelaars voor wat betreft niveauschakelaars. Voor niveaumeting behoren ultrasoon, radar en geleide radar tot de leveringsmogelijkheden. Naast de componenten kunnen tevens complete stuurkasten meegeleverd worden die desgewenst verbonden kunnen worden met uw bovenliggende besturing. Bovendien kunnen wij de mechanische inbouw en inbedrijfsname voor al deze componenten voor u uitvoeren. Hycontrol ME capacitive level switches provide simple, accurate and reliable level control for a wide range of applications. They are suitable for use on liquids, solids, slurries, pastes, granules, powders and pellets in high temperature, high pressure and corrosive environments. Unlike some other capacitive switches, this unit works independently of the tank walls using an integral grounding sleeve without the need for a reference probe, which enables it to be used in concrete, plastic or other non metalic tanks. This technology also provides an ideal solution for interface detection applications such as oil on water and liquid detection underneath a layer of foam. The Hycontrol range of Admittance level switches provide simple, accurate and reliable level control for a wide range of applications. They are suitable for use on liquids, solids, slurries, pastes, granules, powders and pellets in high temperature, high pressure and corrosive environments. The main advantage offered by using this admittance range of switches is their ability to totally ignore product build up on the sensing probe. This unique design utilises a protective insulation electrode between the conventional main electrode and the grounding sleeve which enables the electronics to distinguish between coatings and actual product level. As the damping effect (resistance to vibration) of low viscosity liquids is very small, it is common to use two relatively wide blades to sense the presence of liquid levels. These blades can be short in length for minimal intrusion into the vessel or for use in pipes. This rugged design of switch is used throughout the process industries. It is available with a wide range of flanged or screwed process connections and can have extensions, enabling the probe to reach 3 metres into a tank if required. The wetted parts of standard switches are 316 stainless steel but special Halar coated and Hastelloy switches are used for extremely corrosive applications and hygienic probes are available for the food industry. The switch has visual indication of its on/off status and a test point on the side of the housing to allow an operator to check the function of the switch. 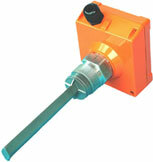 An intrinsically safe and explosion proof version of the switch is available for hazardous areas. The design of a vibrating level switch for solids must be fundamentally different to the design described for liquids. If two large parallel blades were used on powders or solids it would be too easy for product to build-up and become lodged between the blades causing the oscillations of the switch to stop regardless of product level. For solids applications on products ranging from cornflakes to coal, it is preferable to have only one blade in contact with the product. This eliminates the potential for bridging between the forks and ensures that the switch does not give false alarms. 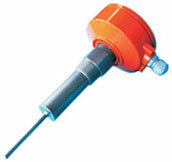 The operating principle is the same for all vibrating probe level switches. A piezo-electric crystal is used to force a blade to oscillate at its fundamental frequency (natural resonance). When the blades come into contact with the process medium the natural frequency of oscillation is damped; the electronics sense the change in frequency which causes the unit to switch. The different electronic outputs to choose from allows the user to switch a load on/off or to interface directly with a computer. The units can be programmed to sense high or low level and failsafe high or low, with adjustable sensitivity to eliminate false switching. The switch is only sensitive at the tip so minimising the effect of build-up on tank walls. Microflex LR pushes the boundaries of non-contact ultrasonic level measurement. This new range of Smart Level Transmitters is capable of measuring distances in excess of 60 metres and is suitable for solids and liquids. Using new technology developed with low frequencies these new transmitters are capable of measuring in extremely difficult applications, including very dusty and dirty environments, where most traditional ultrasonics will fail. Level measurement on difficult solids applications in excess of 60m is now possible with two wire technology. The Microflex LR is available in two configurations with two wire technology; an Integral display (MI) four-button programmable instrument and a SMART blind (MS) version. The compact construction coupled with integral LCD display, three push buttons under the lid for security, and just eight parameters to set means that MICROFLEX-C is probably the simplest level transmitter on the market to calibrate and use. MICROFLEX-C can be configured for either level or distance in meters, feet or a percentage of span. Empty distance and span can be entered in real values, anywhere within the instruments range. With a measuring range of up to 10m, the Hycontrol Miniflex is a versatile unit from Accurate Detection for a wide range of application from small vessels to large process tanks. The Hycontrol Miniflex LR can be configured to display Litres, Gallons, Tonnes, KG, m3 OR %. When used for flow, standard flume and weir configurations are pre-programmed for easy of setup. For non-standard flume applications an option for 24 point linearisation table can be entered. The Hycontrol Miniflex LR has substantial pump control functionality built in, duty standby/assist, alternating duty pump run-on etc. 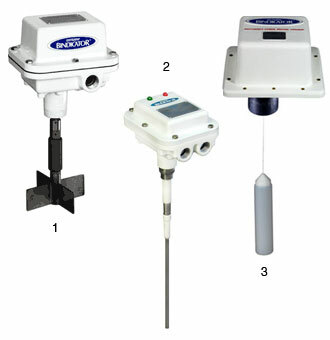 The Hycontrol Miniflex LR is capable of having input from two transducers to the one controller to enable differential measurement of screen rakes, filters etc.Accurate Detection has a large number of the Hycontrol Miniflex LR installed in various quarry, water and waste, process and chemical application. The Reflex VG Series of FMCW Radar products are unaffected by pressure, temperature, viscosity, vacuum, foam, dust or changes in dielectric constant. They can measure virtually any product in either Direct or TBF mode utilising either Horn, Wave Guide or Wave Stick antenna. The unique Tank Bottom Following (TBF) mode in all the VG Series enables products with dielectric constants as low as 1.1 to be measured. For process vessels with complex internal structures the unique Empty Tank Spectrum (ETS) can be utilised to damp out all unwanted reflections from pipes, heating coils and agitators. Bindicator is al decennialang een gereputeerde fabrikant van volmeldsystemen. Wereldwijd zijn ongeveer een miljoen systemen in gebruik. Specifiek voor de Europese markt wordt een CE-label afgeleverd en desgewenst een ATEX- toelating. 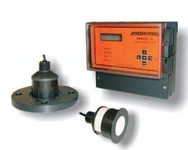 Via de Europese verdeler Rembe®, biedt Weighing & Inspection het volledige Bindicator -gamma aan. Mark-4 Yo Yo: dit systeem wordt bovenaan de de silo gemonteerd. Manueel, of via een vooraf ingesteld tijdsinterval zakt de sonde tot op het product. Van zodra er fysisch contact is keert ze terug en meet de afgelegde afstand. (3).